About 350 schools showed up at the job fair organized by the Shanghai Educational Human Resource Exchange and Service Center. 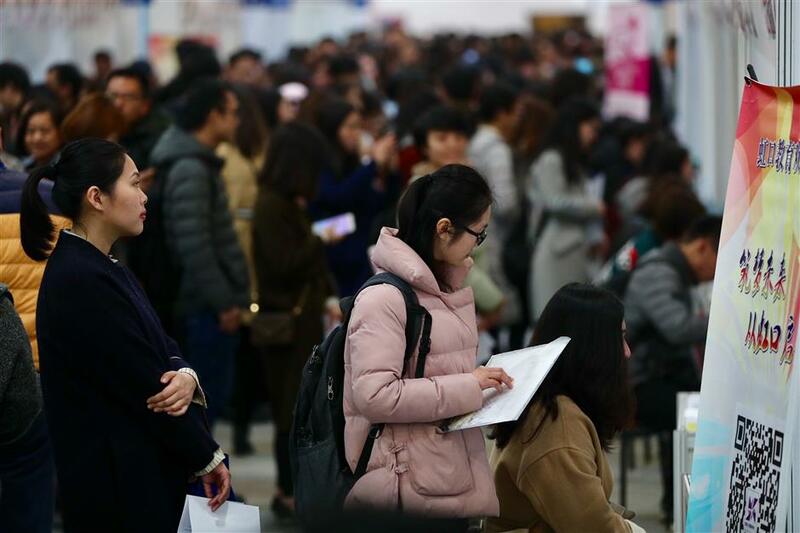 Applicants line up in front of a booth of a school in Hongkou District at a job fair on Sunday. Teachers with expertise in preschool education, arts, music and physical education are still in high demand, according to schools at a job fair in Shanghai on Sunday. About 350 schools showed up at the fair, organized by the Shanghai Educational Human Resource Exchange and Service Center. Hongkou District plans to recruit 68 kindergarten teachers this year, more than one-fifth of its whole hiring target, Zhong Jing, director of the district educational human resource service center, said. “We estimate that about 200 kindergarten teachers in our district will retire between 2016 and 2020, pushing us to make early preparations and hire a large number of new teachers each year,” Zhong added. Meanwhile, with a growing birth rate, more and more kindergartens are opening each year and more and more teachers are needed, but the number of graduates majoring in preschool education at local universities isn't keeping up. At East China Normal University and Shanghai Normal University, the city's two institutes dedicated to cultivating new teachers, students of preschool education are snapped up by local kindergartens before graduation each year. Some are “booked” with early offers during internships. Zhong said she was so excited to see two masters students of preschool education from East China Normal University at the job fair and led them to the booths of two kindergartens in the district immediately. Huang Ying, an official of a kindergarten in Hongkou, said she was glad to see the two applicants as few attendees at the event met the requirements for kindergarten teachers. Meanwhile, the family planning policy that allows each couple to have two children has also impacted on kindergartens as the overwhelming majority of their teachers are female and many are choosing to take time off to start families. Dong Yan, vice principal of the China Welfare Institute Kindergarten, said they were also looking for five teachers this year to replace those planning to have children in the following years. Even though it is a famous model kindergarten, teacher recruitment is not easy, according to Dong. The demand for music, arts and PE teachers is also obvious as most of the schools at the fair listed one or two vacancies for such teachers on their recruitment information. Schools in Changning District alone plan to hire 31 PE teachers this year. Zhong explained that the growth in demand came as educational authorities require schools to offer a wider range of courses for students, such as a policy that requires each school to have a football teacher and another that asks schools to arrange diversified activities after regular class. The Liangcheng No.2 Primary School only sought a music teacher at the fair in order to improve dance education at the school and to organize music and dance related activities after regular classes. “Teachers of music, arts and PE are difficult to hire as there are very few students of these subjects at universities, and fewer who want to teach at schools,” said Ding Yong, the school principal. To attract outstanding talent into schools, many district governments have introduced incentives such as housing subsidies for teachers, while some districts no longer list Shanghai hukou, or permanent residency certificates, as a must for applicants who are outstanding enough, such as graduates from top universities in China. Last year, Minhang District began to provide affordable apartments for outstanding new teachers, while Hongkou District loosened the requirements on local hukou for masters students from top universities. Zhao Zhitong, a masters student majoring in education at East China Normal University, said such favorable incentives and polices were very attractive to her and other students from outside of Shanghai. “Living costs in Shanghai are very high, so I would be willing to work with relatively lower pay if the school can provide an apartment for me,” she said. Zhang Jun, principal of Beihong High School, said the district’s breakthrough in hukou requirements was helpful. Zhong said the district educational human resource service center has applied for more housing subsidies to cover more young teachers, which could also be a new attraction in recruitment. Although some non-professional requirements have been loosened, schools in the city will not lower the requirements on applicants’ professional teaching abilities, said Hu Weiping, an official at the Shanghai Educational Human Resource Exchange and Service Center. Shanghai has been struggling to hire highly qualified teachers as the sector became less attractive due to uncompetitive income and high pressure in recent years. Because of this, the city has introduced a new merit-based pay system favoring teachers with outstanding performance. The central government has also initiated some suggestions to make teaching an enviable career that can give teachers a sense of happiness, achievement and honor. On Saturday, 23,169 people sat the written test for primary and secondary school teaching qualifications, up 52.57 percent from the same time last year.